But as your email list grows, it is important to know that bigger isn’t better. - Nearly 49% of respondents have email accounts for messages they rarely intend to open. Here’s an example of the impact cleaning out inactive subscribers can have. - Initially emailed 13178 newsletters with 1976 unique opens which is a 15% open rate. - After removing the inactive prospects, we emailed 9548 newsletters with 2504 unique opens which is a 26% open rate. Litmus.com (Link: https://litmus.com/blog/have-webmail-users-gone-mobile/webmail-email-market-share-infographic) reported that the percentage of emails opened on a mobile device reached a new high of 51% last year. For webmail users such as Aol, Yahoo, Gmail and Hotmail, the mobile open rate bumps to 61%. 1. 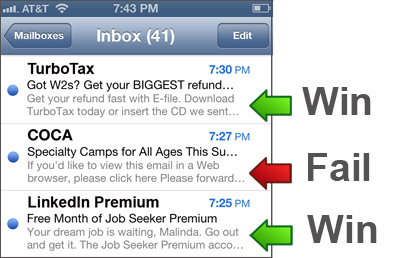 Personalize subject lines with their name. This is an easy one. Personalized subject lines generally deliver higher open rates. 2. Personalize based on their vehicle. Truck month tips can go to truck owners. Summer traveling tips with kids could go to minivan owners. You probably won’t have time to come up with custom content for each type of vehicle, each month – but even if you do it once or twice a year, it can make a nice impression. 4. Personalize by contract. Is their lease expiring? Warranty expiring? These emails can let them know what their options are. 5. Personalize by activity. Has it been over a year since their last vehicle service? Why not send a special offer with a “We Miss You Message.” Or, if they’ve never missed an oil change, how about a thank you with a free car wash offer? As you may know, I’m a big proponent of automotive newsletters as a way to maintain long term relationships with customers, promote front-of-mind awareness and add value to your messages. I often get questions from clients about using email append services to grow their email marketing list. Append services are fine but expensive. Sometimes, the easiest way to get more prospects and customers to join your newsletter list, is simply to ask them. I thought it might be worth reviewing a few options you can use to collect more emails for your car dealership newsletters. 1. Incentivize your service advisors. When customers are in for service, have the advisors check to see if their email address is up-to-date and if there isn’t one on file, ask if they would like to start receiving your helpful newsletter and service coupons. 2. Online sign-ups. Can visitors to your website, blog, facebook page, etc. easily join your email list? What about including a sign-up form on your service coupon page? Get your customers in the habit of checking your newsletter each month for exclusive service coupons and you never know when the article/video about a new model will catch their eye and generates a new sale. It happens all them time. 3. Are you still doing a lot of direct mail to your customers? Why not include a promotion to give away a gas card or an iPad in a free drawing to all of those people who go online to register for your newsletter. Look at what you are spending per direct mail piece and it won’t take long to justify the expense of the prize you give away. 4. In store displays. It is rare that all those business cards that get dropped into a fish bowl to join a mailing list actully ever get entered into a database. For about $500 (about the cost to send 1000 mailers), why not have a computer station in your service lounge so people can sign up directly? Set up an autoresponder so that their sign-up triggers the receipt of a special parts/service/accessory discount. These email capture options are easy to set-up and don’t require a lot of labor to maintain. Yep, it’s soon going to be that time of year when online retailers start flooding your customers’ inboxes with messages of good tidings and special savings. Here are some tips you can implement now, to help your email marketing be more successful in December. Do you normally send out a Happy Holidays email? Why not get ahead of the inbox stampede and send a Happy Thanksgiving email instead. You might want to mention that a gift card to your service department makes a great gift by helping the recipient maintain one of their most expensive investments. If you have folks on your email marketing list that haven’t opened an email from you in a year, do you really think that during the busy holiday season they will start? Probably not. How about sending a re-engagement campaign to them now to find out if they still want to receive your emails? Clearing out these inactive emails will really help your deliverability in December. One of the things email providers look at in determining whether or not to deliver your email to the inbox or the spam folder is how engaged your email list is and getting the inactive folks off helps your open rate. If you’re a car dealer sending automotive newsletters (or you do any type of email marketing), here is an update that will impact your email marketing to Yahoo users. If your current email is bob5468451651@yahoo.com and you’ve always coveted the address bob@yahoo.com – this may be your lucky chance to get it. Once this update goes into effect, a couple of things could happen. Let’s use the example of Bob changing his email from bob5468451651@yahoo.com to to the new bob@yahoo.com which becomes available. A. And a new person registers bob@yahoo.com, you’ll be sending your email to the wrong Bob. What do people do that get email they didn’t ask for? They hit the spam button which impacts your deliverability to all yahoo users if your complaint rate gets too high (we like to stay in the range of 1-2 per 1000). B. And no one registers bob@yahoo.com, you’ll send to a bad email address which will bounce. High bounce rates can impact your deliverability as well. 2. If you currently have bob5468451651@yahoo.com in your email database – you may or may not get notified of the address change. Sending to the old address may or may not forward to the new address. Details aren’t clear yet. 1. Clean out your inactive yahoo user accounts (we recommend this for all email accounts) and continue to purge inactive accounts moving forward since this will affect all yahoo accounts that become inactive at 12 months. 2. Work with a newsletter company that will proactively keep your list clean and your emails going to the inbox… our phone number is (800) 879-8870 if you would like more details. When people are triaging their mobile inbox emails and deciding what to open or delete, they often make that determination by looking at: who it is from, what the subject line is, and what the preheader says. Are you making the most of every character in your emails? With Valentine’s Day around the corner, I thought I’d share some ideas on how you can get a little more love for your email campaign by giving it a second chance. Let’s say you sent off your email and the results aren’t what you expected. Since you’ve already put your time and effort into crafting your message – maybe it has a great offer or it’s a newsletter with helpful info – any additional opens you can get is a bonus without a lot of effort. Here are two situations where this is worth trying and a couple of techniques to help it work. When you look at your open rates broken down by email provider (please tell me you ARE doing this), you notice that one is pretty far off compared to the others. Example: Hotmail opens = 27%, Gmail = 33% and Yahoo = 12%. In this situation, why not try resending your campaign ONLY to Yahoo email addresses that didn’t open the first time? And finally, select you recipients. Using your analytics from your last email, create a database of people who didn’t open it. To be cautious, I would revise this list to include those people who didn’t open this email, but have opened previous emails from you. A few words of caution… if you have a bad email reputation or you are filling up your customers’ inboxes with info they don’t want, sending an email a second time around is going to make your spam complaints skyrocket. This technique is best used cautiously and when you have a special message that warrants a second chance or you’ve identified an issue with a specific email provider. Your inbox is about to get a whole lot busier. Remember the seasonal golf store in the mall that you bought a gift from last December? Chances are you haven’t heard from them all year but right now they are re-opening and it is just a matter of time before you start getting their weekly emails. Chances are you have people on your email list who haven’t opened an email from you in year or so, if ever. What are the chances that December will be the first time they open one? Not nearly as good as the chances that they’ll finally hit the spam button and get you out of their inbox for good. Why not take a look at your list of inactives and if you’re not willing to pull them off your list permanently, at least consider taking them off the send list for December. You may actually see your inbox placement improve as you demonstrate to the email providers that a higher percentage of your list is engaged, opening and clicking on your emails. As I’ve mentioned before, getting great inbox delivery for your automotive newsletters is all about engagement. The email providers are tracking whether people open, read and click on your newsletter or does it go unopened and deleted. Those messages that aren’t opened may very well start getting delivered straight to your customers’ junk folders in the email providers on-going effort to keep only wanted information in the inbox. But recently Chris Penn, the Director of Inbound Marketing at WhatCounts, did a study that showed posting a link to your newsletter from your social media is actually cannibalizing your open rates. If people read your newsletter through facebook, why do they need to open it and read it in your inbox? Your open rates go down and then your deliverability suffers. A much better option is to simply post a social media message asking people to check their inboxes for the latest issue, or to sign up if they aren’t on the list. At 1to1 News, we can automatically generate this post for you as part of sending your newsletter.